Why Promises and When to Use Them? What if You Want to Perform Subsequent Async Action? "Imagine you are a kid. Your mom promises you that she&apos;ll get you a new phone next week." You don&apos;t know if you will get that phone until next week. Your mom can either really buy you a brand new phone, or stand you up and withhold the phone if she is not happy :(. The code is quite expressive in itself. Now that we have the promise, let&apos;s consume it. Let&apos;s run the example and see the result! Let&apos;s say, you, the kid, promises your friend that you will show them the new phone when your mom buy you one. That is another promise. Let&apos;s write it! Let&apos;s chain the promises. You, the kid can only start the showOff promise after the willIGetNewPhone promise. That&apos;s how easy to chain the promise. Promises are asynchronous. Let&apos;s log a message before and after we call the promise. 2. Hey friend, I have a new black Samsung phone. 3. Hey friend, I have a new black Samsung phone. Why? Because life (or JS) waits for no man. You, the kid, wouldn&apos;t stop playing while waiting for your mom promise (the new phone). Don&apos;t you? That&apos;s something we call asynchronous, the code will run without blocking or waiting for the result. Anything that need to wait for promise to proceed, you put that in .then. The demo code is workable in ES5 environments (all major browsers + NodeJs) if you include Bluebird promise library. 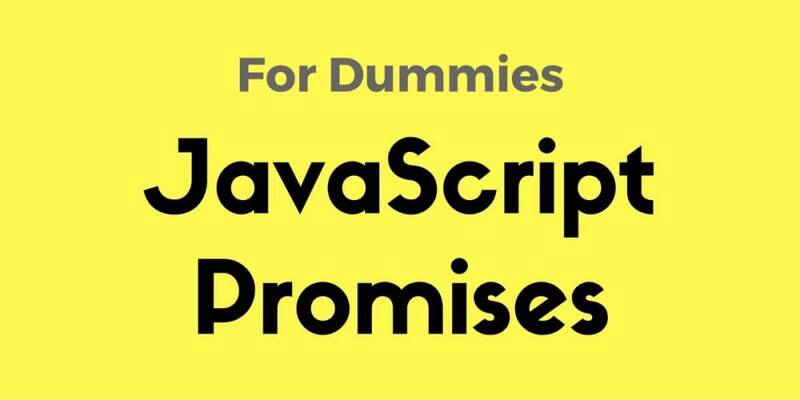 It&apos;s because ES5 doesn&apos;t support promises out of the box. Another famous promise library is Q by Kris Kowal. The demo code works out of the box because ES6 supports promises natively. In addition, with ES6 functions, we can further simplify the code with fat arrow => and use const and let. ES7 introduce async and await syntax. It makes the asynchronous syntax look prettier and easier to understand, without the .then and .catch. Rewrite our example with ES7 syntax. Why do we need promises? How&apos;s the world look like before promise? Before answering these questions, let&apos;s go back to the fundamental. Let&apos;s take a look at these two example, both example perform addition of two number, one add using normal function, the other add remotely. // you get result  = "undefined"
If you add the numbers with normal function, you get the result immediately. However when you issue a remote call to get result, you need to wait, you can&apos;t get the result immediately. Or put it this way, you don&apos;t know if you will get the result because the server might be down, slow in response, etc. You don&apos;t want your entire process to be blocked while waiting for the result. Calling APIs, downloading files, reading files are among some of the usual async operations that you&apos;ll perform. Must we use promise for asynchronous call? Nope. Prior to Promise, we use callback. Callback is just a function you call when you get the return result. Let&apos;s modify the previous example to accept a callback. The syntax looks ok, why do we need promises then? How it looks like with callbacks? The syntax is less user friendly. In a nicer term, It looks like a pyramid, but people usually refer this as "callback hell", because the callback nested into another callback. Imagine you have 10 callbacks, your code will nested 10 times! Promises come in to rescue. Let&apos;s look at the promise version of the same example. Before you settle down with promises, there is something that has come about to make it even easier to deal with async data called Observables. Fear not, let look at the same demo written with Observables. In this example, I am using RxJS for the observables. Observables can do more funky stuff easily. For example, delay add function by 3 seconds with just one line of code or retry so you can retry a call a certain number of times. Well, let&apos;s talk about Observables in future post! Get yourself familiar with callbacks and promises. Understand them and use them. Don&apos;t worry about Observables, just yet. All three can factor into your development depending on the situation.